Electronics Costs > How Much Does Phone Screen Repair Cost? How Much Does Phone Screen Repair Cost? All phones, no matter how durable they may seem, won’t be immune to damage. Unfortunately, phone screens are made from glass, and if not protected, it will break when it’s dropped. While it may not break the first time, it may do so on the 35th time, requiring a repair. If you don’t have insurance for your phone, then you have a few options for repair. How much does it cost to repair a phone screen? On average, the cost to repair a phone screen will depend on the phone make/model, if you have a protection plan/warranty and the company fixing the phone. A screen repair should cost anywhere from as little as $40 to more than $300. The estimates mentioned prior will include all parts and labor. The manufacturer will always use genuine parts, whereas third-party cellphone repair services may use third-party parts. NOTE: Most of these quotes came from third-party repair facilities, not the main manufacturer unless noted. Your results may vary when searching for quotes. All Apple phones, if you were to use Apple, will charge $29 for those who have AppleCare+ or $129 to $169, depending on the exact iPhone model for those who are out of warranty. Refer to our broken iPhone screen costs guide to see what it may cost you. Samsun, on the other hand, performs authorized repairs as well, with repairs in the $270 range, but can be as little as $79 if you purchased the Samsung Protection Plus plan. CNET called a few third-party repair shops, trying to figure out what it would cost to replace a cracked screen. According to their research, they were quoted anywhere from $100 to $250 for a Samsung Galaxy S5 to as much as $270 for the Samsung Galaxy S7. Google Pixel, on the other hand, teamed up with uBreakiFix to help offer walk-in screen repairs, with prices ranging from $129 for the Pixel to $149 for the Pixel XL. If you are going to get your phone repaired via an online service, then most of the time, you will be responsible for the costs of shipping the phone there and back. Apple, for example, charges $6.95 for shipping. Depending on the retailer and how busy they are, most repairs can be done with 24 hours, sometimes even less if you were to use a kiosk at the mall or a mobile repair service, for example. Talk with your cell phone provider to see if your phone is under warranty. Apple, for example, lets you check online to see if your phone is still under warranty and if eligible for repairs. If you’re in the market for a new phone, you may be able to trade your phone in for a credit, even though it has a cracked screen. Ask if you are eligible for an early upgrade or anything that can bring down the cost of buying a new phone. With your next phone, highly consider getting an extended warranty plan or investing in a high-end case to prevent a cracked screen in the future. Get a handful of quotes ahead of time. Most repair shops will be happy to offer you multiple quotes. Most of the time, a repair shop is going to be cheaper than going straight to the manufacturer. For example, the Apple store will probably charge more to replace the screen of an iPhone than an independent shop would, but if you do choose a third-party retailer and your phone is still under warranty, there’s a good chance it will be voided if you were to need to use it in the future. Always read the fine print of your warranty to know your limitations. Some screens are actually pretty easy to replace, and on Amazon or related retailers, there are DIY kits that include everything you need to perform the repair, ranging from the parts to the detailed step-by-step instructions. As long as the broken screen isn’t affecting the functionality of the phone, you can simply deal with it, as long as it’s safe, of course. Either save up money for a new phone or if it makes sense, save for the repair. 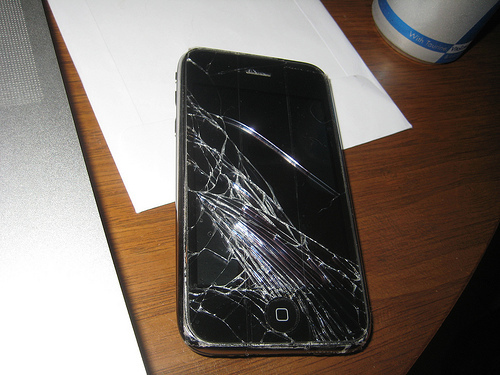 To be safe with broken glass, consider a low-cost glass screen protector to protect your fingers.